← Peter Oundjian – Did he approve this message? Le Carillon National, Ah! ça ira and the Downfall of Paris. M. 1814-Fall of Paris, Riley’s Flute Melodies, Fort York National Heritage Site Library, Toronto, Ontario, Canada. After the fall of Rome, the Swiss are believed to have been the first to move their armies with the sounds of fifes and drums. For more than 150 years, Swiss halberdiers, fighting either to defend their homeland or as mercenaries to foreign monarchs, were the scourge of Renaissance battlefields. At the battle of Marat in 1476, Swiss halberds destroyed French heavy cavalry, proving for the first time in the west that foot soldiers could defeat armored men and horses. Military use of fifes and drums quickly spread to France, the rest of Europe and England. Henry VIII (1491-1547) was a true Renaissance man. He composed music and kept a self serving eye on military innovations. Henry employed kettle and field drummers, but we do not know what they played. After Henry’s death a paper dating from about 1455 was found inscribed with seven military (drum) signals but written in words only. Subsequent to Arbeau’s 1588 Orchesography, and the 1627 Torneo by Bonaventura Pistofilo one might expect drum notation to have evolved along the lines of its pitch producing contemporaries. Drummer’s however appear to have encountered or invented difficulties writing down what they played. Controversies over Renaissance and Classic Era drum notation continue today while readable fife tunes from the same period, abound. The tunes that led men into battle and kept their faces forward were sometimes written by the likes of Handel and Mozart while others were written by the most prolific composers of all, anon. Due in part to their opaque origins, some of the most famous tunes from history proved susceptible to mythologizing. The assistance of my nephew Paul Peeling was invaluable. His computer and library skills allowed him to obtain manuscripts that remained beyond my reach. Within three days of my first conversation with him, manuscripts began arriving in my computer mail box. The manuscripts continued to arrive and I was released from one of the most frustrating aspects of my research. Many years ago, before the idea of this article was born, linguist Dr. Andre Mather translated the words on the first printing of Ah! Ça Ira. Later I called upon his brother Eric to translate the dance movements for Becourt’s Le Carillon National. The translations were not simple because the texts were in a colloquial French spoken more than 200 years ago. Additionally, Becourt’s instructions for the dance were troublesome due to his use of arcane dance step abbreviations. The University of Toronto Faculty of Music Library is one of the best in North America and its head librarian and assistant head are Kathleen McMorrow (ret. 2013) and Susanne Meyers Sawa. They and their staff were extremely gracious and patient as I plied them with questions arcane concerning old war songs, drum beats and the accoutrements of medieval and Renaissance armies. Kathleen once said, “Ask me something difficult!” When I did, she had the answer. Edmund Boyle is a fifer from Philadelphia and an e-mail friend. To say he is well connected is an understatement. He teaches fife students living around the world and maintains a very useful website. Ed has introduced me to fife and drum players and aficionados as well as inspiring me by his restorations of historic drum and fife manuals. My former colleagues in Nexus, Bob Becker and Bill Cahn have, by their interest in and questions about the so called Ancient Style of drumming, emboldened me and on more than one occasion sent me back to my “drawing board”. I have also known some very good drummers whose influence has made me think long and hard about every sentence I write on the subject of rudiments and rudimental drumming. Fred Johnson and Paul Mosley of C.A.D.R.E., Nick Attanassio and Ken Green are a few who immediately come to mind. And of course Dennis DeLucia without whose assistance the 2002 Percussive Arts Society Historic Drummer’s Heritage Concert would not have succeeded. John Wooton and Jim Campbell are two renowned teachers who have often befriended and impressed me with their skills and knowledge. Special tributes to the US Military Academy Band Field Unit, the Hellcats; 3d United States Infantry (The Old Guard) Fife and Drum Corps; and the Colonial Williamsburg Fifes and Drums (also known as the Field Music of the Virginia State Garrison) and their inspired teacher,composer, historian and director, Lance Pedigo. Then there is the inimitable John S. “Jack” Pratt who has guided me around and through many mind fields and who for me will always be the quintessential composer of martial snare drum music. Jack’s knowledge and drumming prowess have been a source of inspiration to field drummers and percussionists world over. I am especially grateful to Ray Dillard for extricating me from more computer crises then anyone should have to endure. As Ray talked me through impasse after impasse, I sometimes felt like a stalled rock climber, frozen by fear, being directed hand and foot until once again safely on the ground. Most important to me has been the support of my wife Eleanor. She has not only suffered my fits of frustration, she has tolerated my writing binges and proven herself an editor of uncanny skill. The music known today as Le Carillon National, Ah! Ça Ira 1 and The Downfall of Paris 2 are in turn, associated with an 18th century dance craze, the French Revolution (1789-99), and the Napoleonic era (1799-1815). Both tunes obtained widespread popularity in Europe, Great Britain, Ireland and North America. Yet very little is known about when or by whom they were written. Only the last name of Le Carillon National’s composer is known, verified by an 18th century piano publication. Anything else about the man is rumor. The lyricist of Ah! Ça Ira was a prolific writer and his last name appears on many French Revolution era documents, but details of his personal life are meager and serve more to tantalize than inform. No written evidence gives the name of the composer of The Downfall of Paris and its first use or appearance is unknown. Nevertheless, certain stories about these works are regularly repeated as fact by authors and lecturers. This article examines the veracity of those stories and reproduces the earliest extant manuscripts of the music. Le Carillon National and M. Becourt. The quadrille titled Le Carillon National 3 was probably written in Paris during the last quarter of the 18th century. M.(Monsieur) Becourt, who, depending on one’s sources, was either a violinist or drummer in the Theatre du Vaudeville or in the Theatre Beaujolais, is cited as its composer. 1. A gentleman and a lady, of opposite, cross over and rigaudoon. 3. Forward with the lady standing beside and to the right, and spin on the spot. 4. Turn by right with the lady of opposite. 5. All four forward and back. 6. The Angloise half chain, and back to your places. Counterpart for the six others. 1790-Ah! Ca Ira, copy of first printing. Ah! Ça Ira, Dictum populaire Air du Carillon National was sung during the storming of the Bastille, (14 July,1789) and again that year on 5 October, when market women from Paris made their famous March to Versailles. 5The women were protesting the price of bread. Ironically, the shortage of food and its high prices were due in part to the French Government’s financial support of America’s War for Independence. 6. By the time of the first festival of Federation in July 1790, commemorating the fall of the Bastille,5 Ah! Ça Ira, had become the premier song of the French Revolution. The manuscript below was in all likelihood published for the occasion with new lyrics by Mr.Deduit. These lyrics express a certain optimism because King Louis had made some concessions to the people of France. C. 1790-LE RETOUR DU CHAMP DE MARS, Lyrics by Mr. Deduit. (Bibliotheque Nationale et Universitaire, Strasbourg.) On 17 July 1791, the infamous massacre known in France as the fusillade du Champ-de-Mars took place. Citizens had gathered to sign a petition demanding the King be removed. After dispersing, the crowd returned led by Georges Jacques Danton (1759 – 1794) and was fired upon by the National Guard commanded by the Marquis de Lafayette (1757-1834). Estimates of the number killed ranged from twelve to fifty. As events became darker, the words to Ah! Ça Ira became ever more threatening and abhorrent to European monarchs. And with good reason. Two years later on 21 January, 1793. King Louis XVI was beheaded. Le Carillon National was reputedly first set to words by a former soldier and professional street singer M.Ladre.7 Though little is known about Ladre, he did exist and is credited with writing the lyrics to the first Ah! Ça Ira. He submitted a formal request to the Committee of Public Instruction asking financial renumeration for his service to the nation as a lyricist. His claim was rejected. 8. Ladre composed more than 50 other revolutionary songs. 9. In the period just prior to and during the French Revolution, political messages were sometimes printed on pieces of paper and sold for a pittance on street corners. The texts were often set to popular tunes which facilitated memorization and dissemination. Below is such a printing with Ladre’s lyrics, though unattributed, with the title Chanson Novelle,, Le Carrillon National, the tune by Becourt to which the words were meant to be sung. Benjamin Franklin and Marquis de Lafayette. How Ladre’s song obtained its name is a popular yet unsubstantiated story. During his tenure as American Ambassador to France (December 1776-85) Parisians are said to have asked Benjamin Franklin about the prospects for American colonial independence. Franklin’s response was,“Ah! ça ira” meaning, “It will happen”, or, “It’s going to be alright”.The Marquis de Lafayette is said to have overheard Franklin’s comment, and suggested to Ladre that he name his song Ah! Ça Ira. Considering LaFayette’s noble heritage and great wealth, his empathy for the monarchy, his position as leader of the King’s Paris Guard at the time of the attack on the Bastille and the Massacre on the Champ de Mars, it is very unlikely he ever met Ladre let alone suggested as a title for his anti-establishment song, a colloquialism by Benjamin Franklin. Ben Franklin, age 72 when his ambassadorship began, was a great celebrity in Paris. He was admired, written about, hovered over and feted wherever he went, 10 but no contemporary documents written either by Franklin, Lafayette, Ladre or anyone else, credits Franklin with inadvertently naming Ladre’s song. Professor Laura Mason, University of Georgia. Letter to R. E.
Elson did not reproduce the original copy of his Cotillion, preferring rather to have all his music examples freshly engraved. Therefore, his Cotillion is pristine, without signs of use or age and the pages are undated and lack either a composer’s name or publisher’s imprint. Elson provides no attribution other than stating it is from his personal collection. Another common story attached to Ah! 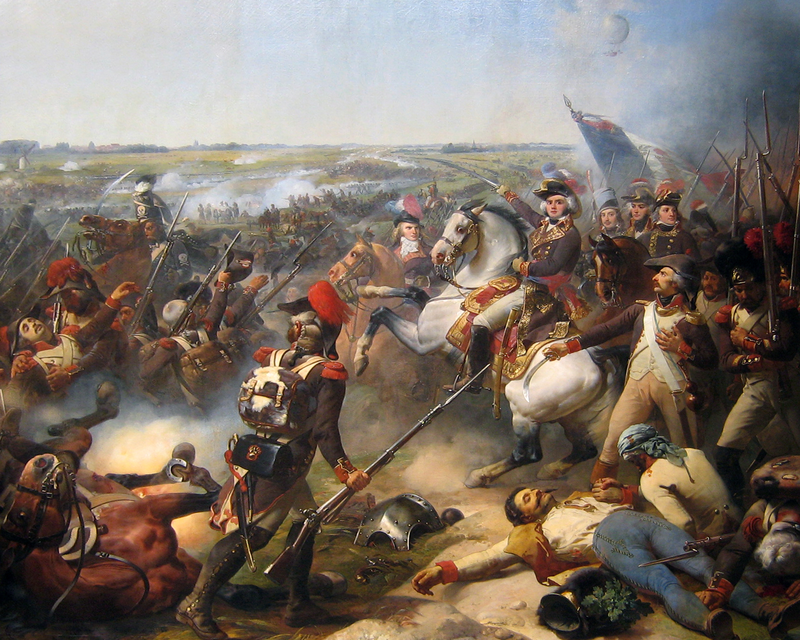 Ça Ira concerns an event following Napoleon’s final defeat . During the triumphal march down the Champs Êlysées, 7 July, 1815, allied bands of the Austrian, Prussian and Russian armies were said to have played Ah! Ça Ira. The crowned heads of Europe attending would have known this tune and the history of its populist uprisings and Madame Guillotine. Aghast, Wellington commanded the musicians to cease.12. Given the popularity of Ah! Ça Ira and the military tradition of playing tunes of defeated enemies, this story sounds plausible. However, the idea of all allied bands playing the same tune is suspicious.13. The most oft quoted source for this musical faux pas is in Lewis Winstock, Songs and Music of the Redcoats: A History of the War Music of the British Army, 1970, pp. 105-07. Winstock quotes an eye-witness account by a Captain Blakeney who said the Austrian, Prussian and Russian army musicians played the downfall of Paris. Subsequently he learned that those musicians had actually played what they knew to be Ça Ira.On page 106 Winstock reproduces the first strain of the tune which he titles “The downfall of Paris”. It is not Ça Ira. Indeed it is, with minor deviations, the Downfall of Paris as commonly published at the time. But the matter doesn’t end there. Winstock says Captain Blakeney was” peeved” to hear this tune because it was, quotes Winstock, ” a tune of ours”. Thus, Winstock and Blakeney believed the Downfall and Ça Ira were the same tune and the tune was of British origin. Here indeed is a case of mistaken identity and attribution. Years prior to Captain Blakeney’s observations, these tunes were well known by their own name and there should have been no excuse for confusion. To enforce the point, listed below are some prominent events in the history of these works that predate the allied victory parade in Paris. 1790 – 20 and 21 December. A popular story, often told and printed, says William Shield wrote an opera for Covent Garden titled The Picture of Paris and included Ah! Ça Ira. The date and location are entirely accurate, but the rest is problematical. The truth is messier, but more fun. In 18th century England, pantomimes were a popular form of entertainment especially during the holiday season of Christmas. They were light entertainments, often employing on stage mechanical devices. Thomas Harris(1742-1820), the manager of Theatre Royal Covent Garden wished to capitalize on holiday traffic by presenting a pantomime on a popular contemporary theme, the French Revolution. He hired the controversial playwright and poet Robert Merry (1755-98) and staff writer Charles Bonner to write a libretto and engaged the attractive and popular actress Anne Bruton to play a leading role. The Covent Garden in-house composer was William Shield (1748-1829), considered something of a workhorse for writing incidental music for plays and pantomimes within tight deadlines. Shield probably wrote the arrangement of Ça Ira that was played in the orchestra after the prologue. However, inserted throughout the pantomime were vocal selections from the opera Amphion, by Dresden born composer Johan Gottlieb Naumann (1741-1801). In this case Shield could be considered an assembler of music for a pantomime rather than the composer of an opera. Five artists were hired to paint the scenery which accurately depicted Paris locations associated with the revolution. Machinery was constructed for special effects. The resultant pastiche was premiered on 20 December, 1790 and titled The Picture of Paris, Taken in the Year of 1790. A critic called it a “Hodge Podge, two act pantomime concocted by Charles Bonner and Robert Merry”. Appalled by what they called the “Follies”, Ann Bruton and another actor refused to appear in the second, and last performance. Harris was castigated for his profligate production and the Tory government under William Pitt, nervous about the potential spread of the revolution to England, let him know that future productions should not dabble in politics.14. ca. 1795 – The Downfall is published in England by Gow and Shepherd under the title The much admired quick step called the Downfall of Paris. 1801 – The Downfall crosses the Atlantic and is published in Philadelphia by G. Wilig and Sons. G. E. Blake of Philadelphia publishes it in 1812 as does G. Graupner of Boston. With these histories, how was it possible for Blakeney, a contemporary military man, to confuse the two tunes? Was he so deceived by the eighth and 2/16th note motive, he failed to notice the disparity between them? Had he forgotten or ever known the French heritage of Ça Ira? Was Winstock simply unaware of their existence as two different works? Or was he fabricating an entertaining Anglo centric story for history? Whatever the reason, in the minds of some people the two names became associated with one tune, The Downfall of Paris. SURRENDER OF PARIS, Downfall of Paris, Fall of Paris, The Fall of Paris or The Downfall of Paris. I am indebted to Joe Whitney, fifer and drummer of Virginia, for reading this article and informing me of a manuscript titled “The7th Reg., Quick March or Surrender of Paris” in the possession of the Cadbury Research Library: Special Collections, University of Birmingham, England. Though Mr. Whitney had not seen the manuscript, he quoted the national tune index to confirm “Surrender of Paris” was what later became known as “The Downfall of Paris”. “Surrender of Paris” appears on page 5 of a tune book inscribed “1788” and “Thos. Molyneux., English – 6th Regnt Shelburn, Nova Scotia”. Subsequently I purchased a copy of the manuscript from Cadbury Research Library. It is indeed what we know today as The Downfall of Paris. Of interest in this Surrender of Paris, is a Tag which does not appear in any version of the Downfall I’ve seen. If the date 1788 and entry of the tune coincided, Surrender of Paris would predate by 7 years the earliest printed version of The Fall of Paris in my possession and by 2 years the first printings of Le Carillon National and Ah! Ça Ira. However, dates such as those found in Molyneux tend to raise questions. 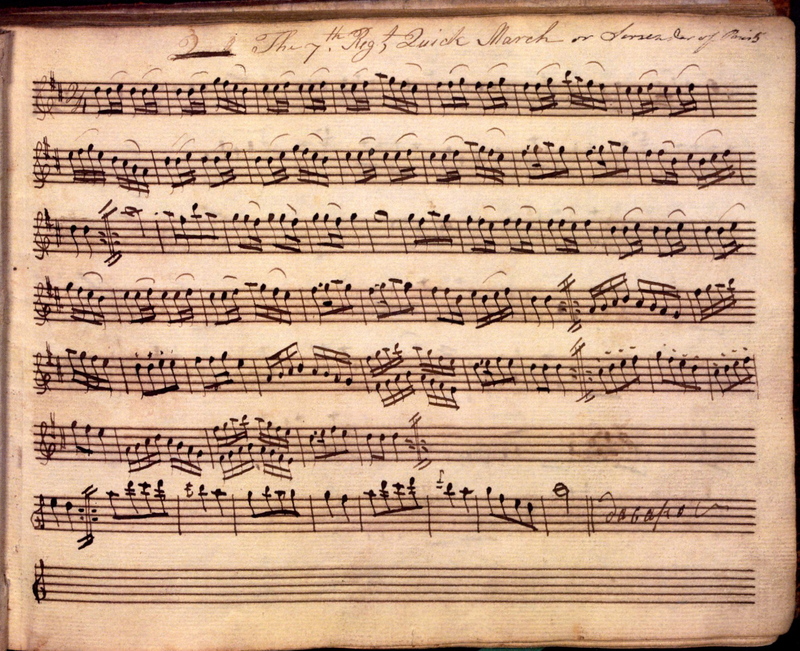 Was 1788 the date Molyneux purchased his tune book and the “Surrender of Paris” entered later? Or did a relative incorrectly inscribe the book years after Molyneux’s death? And was the regiment in Nova Scotia in 1788? The meaning of the title also presents something of a conundrum. “Surrender” might refer to the Treaty of Paris after the Seven years War between Britain and France, known in North America as the French and Indian War.(1754-63). The treaty made France cede all its Canadian territories to Britain and Louisiana to Spain. Whoever chose the title could well have considered the Treaty of Paris to have been the surrender of Paris. Moreover, in 1783, five years before Molyneux, there was another Treaty of Paris, this one ending the United States War for Independence. Might a staunch loyalist soldier considered this to have been a surrender? As a manuscript title, The Fall of Paris does not appear until five years after the beginning of the French Revolution and by 1812 the title The Downfall of Paris appears. Did the 7th Royal Fusiliers (City of London) keep their “Surrender” Quick March while other British Army musicians began playing The Fall and Downfall? “The 7th .Regiment was formed in 1685 from 2 Companies of the Tower of London Guard. They were bestowed the title of The Royal Fusiliers (City of London Regiment), 7th. Regiment of Foot, until the British Army Regimental numbering system was abolished in 1881, thus dropping the 7th. number with their Depot in the Tower and, along with the 5 Foot Guards Regiments, has today the privilege of marching through the City of London with ‘bayonets fixed, Colors flying and drums beating’. It served in Canada in1751. “The 7th were the Royal Fusiliers (City of London) and the 6th the Warwickshire. Regiment.” Greg Tunesi. Below,is a ca.1795 printing from Dublin, Ireland of The Fall of Paris or Essex’s Quickstep.16 (The manuscript is in a layout popular during the late 18th and early 19th centuries; a rather simple keyboard adaptation published with an additional part for melody instruments.) This version, as with three others shown below from 1805 and 1814, does not give a composer’s name. Commercial publications such as this, usually made by in-house arrangers, suggest the tune was already well known, in the air if you will. Aside from dotted notes, the absence of a triplet 16th note pickup to the first measure and some melodic alterations just prior to phrase endings, this 1795 melody is remarkably similar to the arrangement Daniel Emmett made about 67 years later. But whence cometh the name The Fall of Paris? England and France were perennial enemies and, if one accepts English authorship, the title could have been inspired by wishful thinking. Perhaps an ex pat or republican sympathizer meant it as a musical momento mori when the great city was despoiled by Revolution. However, no explanation, composer’s name or date appears on this or any other manuscript of the tune. H. ca.1795- The fall of Paris or Essex Quick Step: for the piano forte or harpsichord with Flute or Guitar, 16. Book Dated ca.1795. Ken Purvis, historian and War of 1812 specialist, said he’d heard the Downfall was written by British musicians as a parody of Ah! Ça Ira. A parody it may have been. Unlike most folk tunes which are in an A-B-(A) form, The Fall of Paris, is structured A-B-C-D, which for a parodist, allows more repetitions of the eighth and two sixteenth motive. The H. Andrews version below, from 1805 contains thirty one repetitions of the eighth and two sixteenth motif where as the 1790 Ah! Ça Ira contains only nineteen. K. Complete Instruction for the Fife,H. Andrews, London, England, 1805. Because of its dynamics, the H. Andrews is of more than passing interest. As a rule,folk songs in collections, diaries and manuscripts do not contain dynamics. Therefore in this example their use and placement is unusual. N . Downfall of Paris, arranged by George B. Bruce and Dan D. Emmett, Drummers and Fifers Guide, Wm. Pond and Co., New York, 1862 . With the assistance of Ed Boyle the following additional titles for Downfall of Paris were found on contemporary song indexes: Ça Ira, Carillon National, Ceimsios Parais – Central Paris?, Downfall Of Paris, The Downfall Of Paris March, The Downfall Of Paris Set Dance – n.b. Irish set dances are based in the Quadrille, England The Home Of The World, The Fall Of Paris, La Ira,. There are probably many more. I also wanted to investigate some of the more popular anecdotes which accompany these tunes. In their telling, they were entertaining, but I had never seen nor heard any proof of their accuracy. Of the two tunes, the Downfall, as it is popularly referred to today, is better known in North America because of its inclusion in Daniel Emmet and George Bruce’s famous Drummers’ & Fifers’ Guide of 1862. The Guide was never approved for use by the Union Army probably because it was considered too difficult for the average military musician, but Bruce and Emmett’s arrangements achieved a kind of cult status, most notably among drummers and The Downfall of Paris especially has been lauded as a perfect blending of melody and rhythm. Judging by the number of arrangements for piano and melody instruments published in the Eastern states just prior to and after the War of 1812, The Downfall of Paris was a popular tune in the parlors of American homes. (Popular as well in other countries.) During my searches I found among other oddities, The fall of Paris: a favorite Russian air arranged as a rondo with an introduction for the harp, Published in London by the Royal Harmonic Institution, 1823. The eminent musicologist Henry George Farmer (1882-1865) expressed concern for the lack of interest his fellow countrymen displayed towards British military music. The mysteries surrounding the date and authorship of the Downfall of Paris seem to make his point. I suspect all the questions surrounding Le Carillon National, Ah! Ça Ira and the Downfall of Paris will not be answered fully here, or to everyone’s satisfaction. But perhaps this and future articles will ameliorate some of the more egregious anecdotes. As my friend, scholar David Waterhouse said, “It never ends”. 1. Pronounced ah sah ear-rah. 2. The earliest manuscripts are titled Fall of Paris and The Fall of Paris. 3.The Quadrille was an intricate exhibition of military horsemanship dating from the 1600s. It inspired a dance which became all the rage in Europe. Composers such as Joseph Lanner (1801-43) and members of the Strauss family wrote Quadrilles. The dance was introduced into France during the 1760s where it became a lively dance for couples known as Quadrille de Contredanses. The Quadrille reached England in 1803 where by 1813 it was fashionable among the upper class. The Bibliotheque national de Francaise, the Bibliotheque nationale et Universitare, Strasbourg and the University of California, Los Angeles have copies of this Frere publication and date them 1790. See also; Brecy, Robert: “The French Revolution in Song”, page 59, Francis Van De Velt/Christian Pirot, France,1988 and Mason, Laura: “Singing the French Revolution. Popular Culture and Politics,1787-1799”, Cornell University Press, 1996. 4. The Rare Books Collection of the University of Toronto Library maintains a copy of Constant Pierre’s Les hymnes et chansons de la Revolution: apercu general et catalogue, Paris, 1904, but Becourt’s name does not appear. 5. The Bastille was stormed to obtain its cache of weapons. At the time only eleven prisoners were incarcerated. There would have been twelve had not the Marquis de Sade (1740-1814) been moved earlier to another location. The Marquis spent thirty years in prison, but was a delegate to the Revolutionary Council during the Revolution. 6. Id. Mason, Laura. Pages 162-63. See also Schama, Simon; Citizens, Alfred Knopf, New York, 1989. 7. I am indebted to linguist Andre Mather for his translation of the original Ladre lyrics to Ah! 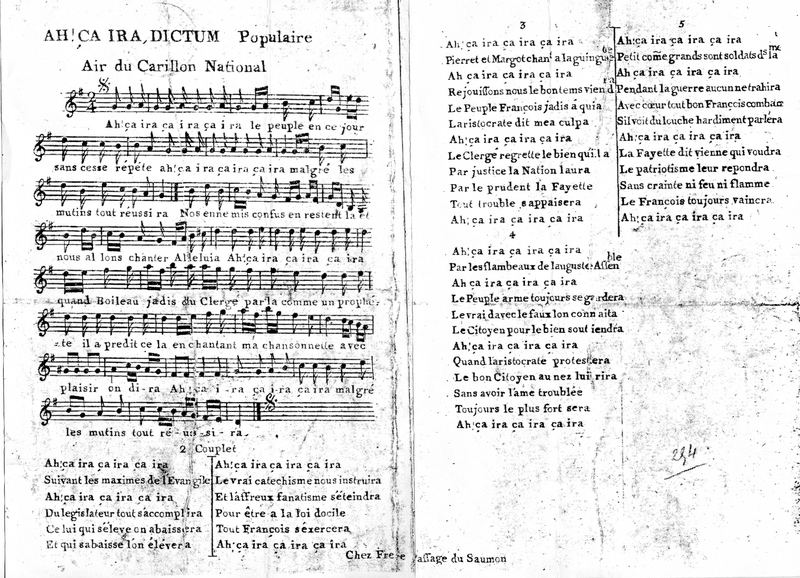 Ça Ira Dictum Populaire Air du Carillon National, (1790) as published in Brecy, the lyrics to Chanson Patriotique (tune: Ah! Ça Ira) July 1791, Brecy, and other insights into the French revolutionary period. and we are going to sing Alleluia. Ah ça ira, ça ira, ça ira. Chanson Patriotique, July 14, 1791, translated from Brecy. this clique will flow away. Below are two contemporary paintings of the battle, each showing the Charles and Robert brother’s Hydrogen balloon. 11. This reminds me somewhat of Aaron Copland’s Appalachian Spring, where Copland used the great Shaker gift song Simple Gifts, but changed the original eight and one half bar phrase to eight bars. See: Patterson, David W.; The Shaker Spiritual, page 372-3, Dover Publications Inc., Mineola, NY, 2000. 12. If British troops participated, the culprits were probably musicians of the British Army 14th of Foot. The Quick march of the 14th, later incorporated into the Yorkshire Regiment, had beenAh! Ça Ira for about twenty years prior to the battle of Waterloo and is the Quick march of the Yorkshire Regiment today. 13. A similar story comes from the American War for Independence. In 1781 Lord Cornwallis surrendered at Yorktown, and 8,000 soldiers, a third of all British land forces in North America laid down their arms. Surrendering, were battalions and brigades from ten British regiments, each possessing its own band and battle honored tune. As they marched out of Yorktown, the British and Hessian troops were said to have played The World Turned Upside Down. (ca. 1646) Perhaps The World Turned Upside Down was played at Yorktown, but it seems very unlikely that all the musicians, including the Germans, would, or could have played this one tune. Further, it is not mentioned in contemporary accounts of the surrender. The phrase The World Turned Upside Down has become synonymous with major socio political upheavals. It has survived 350 years and is suggested during Mel Gibson’s film The Patriot when Cornwallis recognizing defeat at the hands of a colonial “rabble” says forlornly, “Nothing will ever be the same”. Years later an eyewitness to the surrender claimed Yankee Doodle (ca. 1758)) was played by Colonial musicians. The surrendering British troops, proud veterans too, humiliated to acknowledge their defeat by a peasant colonial army, steadfastly looked at the French who were aligned on the opposite side of the road from the colonials. An irate Marquis de Lafayette is said to have ordered Washington’s musicians to play Yankee Doodle, originally an English tune, ‘at’ the British in order to make them acknowledge their conquerors. According to David McCullough in his book The Greater Journey, Americans in Paris, this event is confirmed by the Marquis himself. 14. A primary source of information for Covent Garden’s production of the pantomime The Picture of Paris &c. was the 37 page vocal score published by Longman and Broderip, London. The score lists Naumann, Merry and Shields as authors and contains information regarding the music,the placement of Ah! Ça Ira and a cast of characters. Anne Bruton, see Doty, Gresdna; The Career of Mrs. Anne Brunton Merry in the American Theatre, pages 34 – 35, Charles Bonner &c., see Highfill, Philip H; ,A Biographical Dictionary of Actors, Actresses, Musicians, Dancers, Managers and Other Stage Personnel in London, 1660 to 1800; Volume 16, page 71, The Board of Trustees, Southern Illinois University, 1993. Johan Gottlieb Naumann studied in Dresden, Germany with a student of Bach and today is mostly known as the composer of the Dresden Amen. Felix Mendelsohn in the Reformation Symphony and Richard Wagner in his opera Parsifal, used Naumann’s Amen. 15. The British troops at the battle of Farmars were commanded by the Duke of York. To honor him and from a sense of patriotic duty, the first Govenor General of Canada, John Graves Simcoe changed the name of Toronto, a native American name, to York. The town soon became known as Muddy York because of its location which bordered a lake to the south and a swamp to the east , both creating almost impassable roads in spring and winter. York was renamed Toronto in 1834. O. 1794-Ah! Ça Ira, The Aird Collection, Fort York National Heritage Site Library, Toronto, Ontario, Canada. 16. “The dance Essex Quickstep was in all likelihood not named for a person, but rather for the county in England whose early Saxon name means East Saxon.” David Waterhouse, phone conversation with R.E. Margaret Jones, Senior Asst. Librarian, Music Dept., Cambridge University Library. Letter to R.E. 17. The National Archives of Canada, Ottawa. Ken Purvis, Historian, Montgomery’s Inn, Toronto. Letter to R.E. 18. Piaf sings Ah! Ça Ira: Click HERE. 19. The Yorkshire Regimental Band playing its Quick March, Ça Ira. Click HERE. 20. The tune appears as Downfall of Parais (sic) in Vol. 9 of Musical Miscellany, The Martial Music of Camp Dupont, &c Pennsylvania, published by the author in Philadelphia, PA, 1815. Have you seen the version in H.C. Hart’s New and Improved Instructor for the Drum? It was published in 1862 and the fife version is much closer to earlier versions you have given here. I don’t know which of Bruce or Hart published first in 1862. It is probably likely that Hart’s fife and drum parts were more commonly played during the Civil War than Bruce’s since Hart’s deviated less from earlier versions, making it more traditional. I’ll register for your RSS feed and bookmark your site so I can easily return to check out even more. Thank you so much! You may be in other worlds…but you were here when I needed you. BRAVO ZULU!